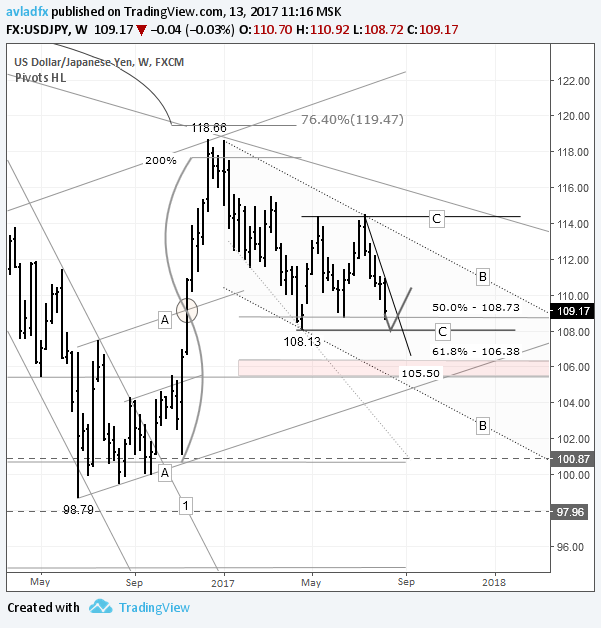 Trading opportunities on the currency pair: Despite the rise in geopolitical tensions between the US and North Korea, some technical bullish signals are being seen on the US dollar. The lower boundary of the C-C channel and the 50% level have formed a strong support zone between 108.13 and 108.73. A double bullish divergence has formed between the price and the AC indicator. The daily candlestick on Friday closed with a doji. If the price starts to grow from its current level, should it break 109.90, this growth will continue to 111.05. 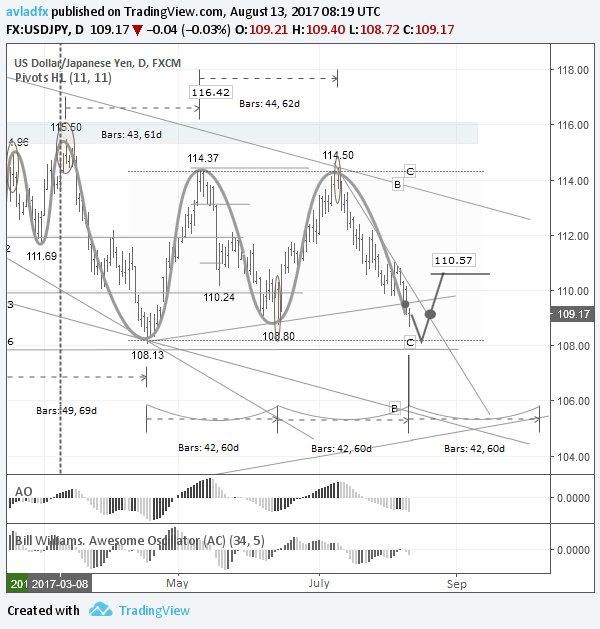 I’m expecting to see a rebound from 108.13 with a target of 110.57. The last idea on this currency pair was published on the 8th of May, 2017. At the time of publication, the US dollar was selling for 112.55 JPY. As the price approached the trend line, large speculators started closing their long positions on the yen. As a result of this, I was expecting to see a classic rebound from the trend line and a drop for the dollar to 111 JPY, or to 109.25 had the price broken 110. Both targets were reached, although I don’t believe that my idea of a rebound fully came off. The dollar started to fall from 114.37 4 days after the review was published. In the space of 5 weeks, the US dollar has fallen by 4.25% against the yen (473 pips). This drop gathered pace on the back of a retreat towards safe haven assets (including the yen) owing to a rise in geopolitical tensions between the US and North Korea. The rhetoric coming out of Washington and Pyongyang is escalating. In a telephone call on the 12th of August, Donald Trump relayed to French president Emmanuel Macron that the US was ready to attack North Korea if they fail to stop their nuclear program and to stop conducting ballistic missile tests. Britain, China, and the EU have called on the US to find a diplomatic solution to the crisis. North Korea continues to conduct ballistic missile tests under the pretense of protecting themselves from the US despite sanctions from the UN Security Council, which were intensified on the 7th of August. According to reports, around 3.5 million have volunteered to join the North Korean army to help protect their country. Now we’ll take a look at some technical analysis and what may be in store for the dollar and yen. Before doing some technical analysis, we need to impose the Fibonacci net over the upwards movement from 98.97 to 118.66. The 50% level at 108.73 is providing strong support to the dollar. Now we should form two channels; B-B and C-C. I hope I don’t need to explain how they’re formed. I’ll return to this later, but first I’d like to take a look at the latest COT report. On Friday, the 11th of August, the CFTC (Commodity Futures Trading Commission) brought out a new weekly report. The COT (Commitments of Traders) report gives a summary of traders’ open positions between 02/08/17 and 08/08/17 inclusive. Large speculators (Non-commercial): In the last week, long positions have increased by 5,334 to 36,483 contracts. Short positions have fallen by 12,838 to 136,105 contracts. Net short positions have fallen by 18,171 to 99,622 contracts. Small speculators (Non-reportable positions): Long positions have risen by 624 to 22,249 contracts, while short positions have grown by 2,223 to 36,858 contracts, Net short positions have risen by 1,598 to 14,609 contracts. Hedgers (Commercial): This group of market participants tends to open long positions against large speculators. In the last week, they’ve reduced their long positions by 17,812 to 184,541 contracts. Short positions have fallen by 1,239 to 70,310 contracts. Open interest has fallen by 18,190 to 266,611 contracts. The last 3 trading days have not been included in this latest COT report. In this time, the Japanese yen has risen against the dollar by 1.69%. I think it likely that in the next report, we’ll see this upwards trend on the yen continue. The latest data shows that large speculators are increasing their long positions and reducing short positions. Hedgers, on the contrary, are actively selling yen. Small speculators are going against the trend, but we can see that in the last week, their tactics haven’t worked out. The lower boundary of the C-C channel and the 50% level have joined to form a strong support zone at 108.13 – 108.73. Taking the data of the COT report into account, I’m going to risk going for a rebound from this zone up to 110.57. One should understand that such a rebound will only occur if the US and North Korea manage to find a diplomatic solution to this conflict. After breaking the 109.50 support (projected from 108.13 and 108.80 lows), sellers will take aim at the lower boundary of the C-C channel at 108.13. Despite the negatives, there are some positive factors for the dollar. 1. The distance between the lows of the 17th of April (108.13) and the 16th of June (108.80) is 42 bars or 58 days. Between the 16th of June and the 11th of August there’s also a distance of 42 bars or 58 days. 2. A double bullish divergence has formed between the price and the AC indicator. 3. The daily candlestick closed with a doji on Friday, suspending the downwards trend. If the price starts to grow from its current level, then when it breaks 109.90, the growth will continue to 111.05. I’m expecting a rebound from 108.13 to 110.57.